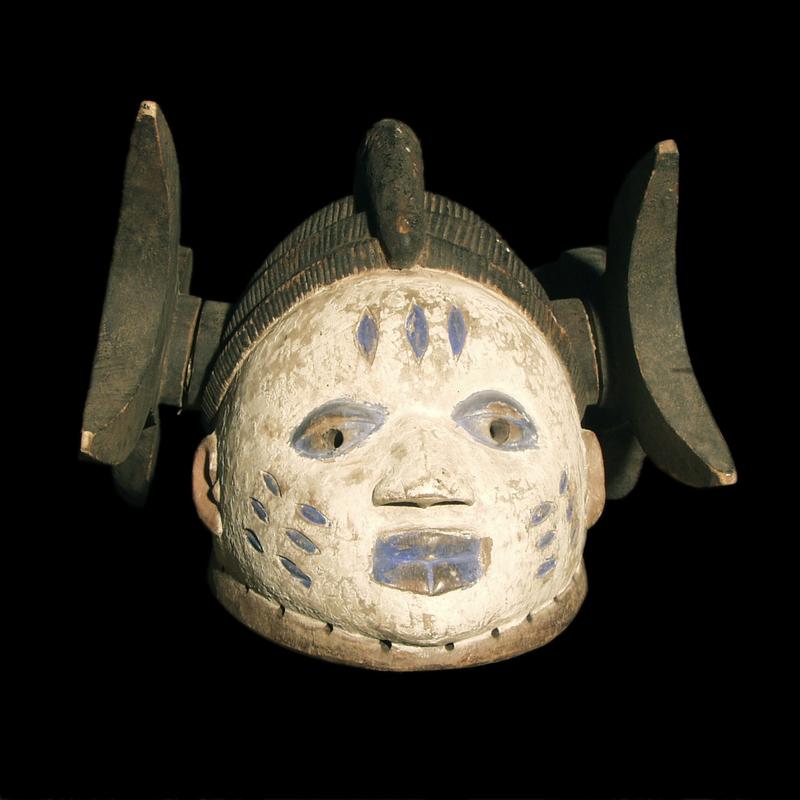 Yoruba masks, and particularly gèlèdè masks, emanate from societies characterized at the same time by unit and diversity around a common origin: the city of Ilé-Ifé, where the Yoruba people thinks that the first man appeared. The most part of Yoruba lives in Nigeria, where they constitute the biggest urban civilization of Western Africa, but they are also present on all African continent, where they constitute cores tied to their origins. It explains the cultural diversity of groups, which invented a new identity according to their migrations. The society of gèlèdè is organized around the "mothers" and meets at night. The "mothers" are being supposed to change into birds and be invited by souls to examine the possible problems of the society. Although they are exclusively carried by men, they’re created by and for women. Ordered by a woman, it is the women that contacts their dance. They can also serve for receiving political authorities, treat problems in a more individual manner, and to distract. The gèlèdè masks are underlined by scarifications on cheeks and forehead, characteristic of yoruba civilization, which counts dozens varieties. The present type of scarification on this mask is called abaja. The wood choosen to be the manufacture of gèlèdè is a clear and light wood. 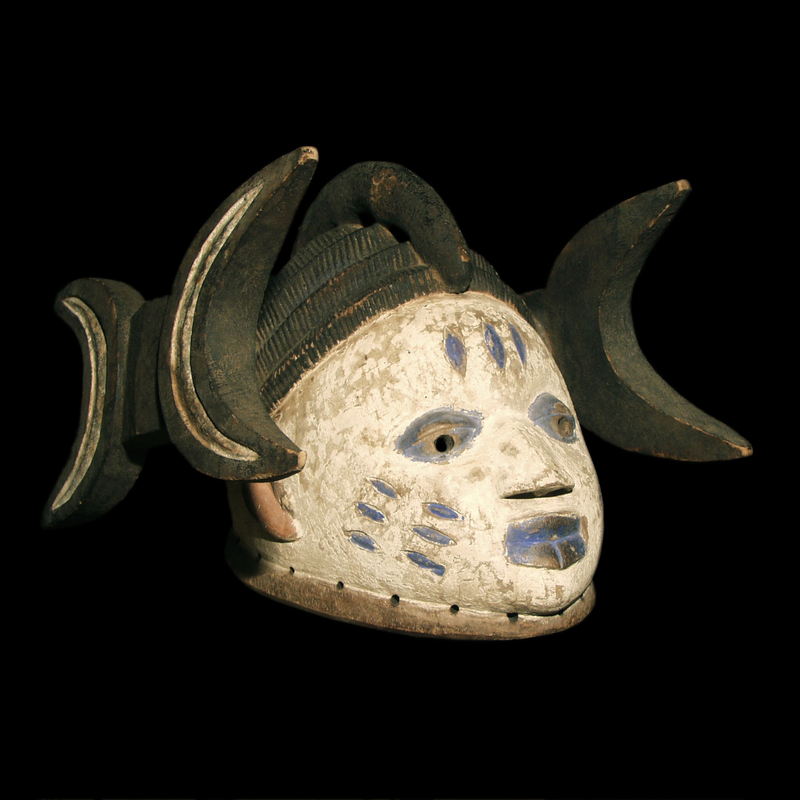 Once sculpted, masks are coated with invisible substances by ancient, guarantors of the protection of the community. They are kept out of the view of the non-initiating, often above the home, smoke of which has protective virtues. They can be used during about fifty years before being replaced. Gèlèdè masks are of a very big diversity: simple head with plaited hair, or combed by a hat, by a neckerchief sometimes overcome by a load or by a stage fixed with tops or of ankles. All masks have prominent eyes, pierced in the centre and delimited by hemmed eyelids. The nose, lightly hooked, introduces rounded up bones. The mouth with the muscular lips is in general closed. This item is endowed with a hairstyle, composed of braids and fins above ears, similar to one of the masks yoruba kept in the Museum of the Man in Paris (visible in Yoruba. Masques et rituels africain on the page 61).